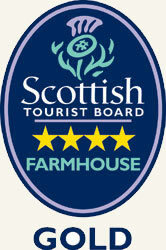 On arrival at Newton Farmhouse, recently awarded "Most Hospitable B&B in the Region" by VisitScotland, you will find the car park is conveniently located next to the guest entrance with the added benefit of CCTV coverage of the parking area. After we have welcomed you into our home, decorated throughout with aspects of nature, we will settle you into our charming, family room en-suite perfectly located on the ground floor, so after a day of exploring you don’t have to carry your luggage up stairs. With a small en-suite shower and wc, our large family room is smartly decorated in a relaxed country style offering magnificent, panoramic views across the farm towards Carrot hill to the South. Comprising one double bed and one double sofa bed, our family room can sleep up to four guests as single, double, twin or family occupancy, and as a child friendly home we have a cot available by request, and other baby/toddler accessories as required. Pet friendly by prior arrangement. We also have a cottage on the farm perfect for larger groups with the option to have bed & breakfast or self cater. Please see our cottage page. To make your stay as comfortable as possible we have added many extras including a selection of teas with coffee & hot chocolate making facilities, pilsner beer and wine glasses, mini fridge, 39” LCD digital television, USB Multi charger, DVD, radio alarm clock, ipod dock, electric shaver socket, ironing facilities, hairdryer, trouser press and comfortable seating all within the guest room. For your added enjoyment a selection of books, magazines, local information and DVD’s are available. There are many lighting options within the guest room so you can create your own ambience, relax and read in the evening or perhaps catch up with work. Free guest wifi is provided. If you require dinner in the evening we can recommend many restaurants in the area to suit all tastes and have a selection of menus from which to choose the best. Each of our special recommendations supports the use of local produce and fresh home cooked food. We also have a fridge and microwave available in the dining room for guest use. Please note we request that any hot food be eaten in our dining room and not in the bedroom and are happy to provide plates, cutlery, etc. Bring your own alcohol and we can loan you the bottle opener or corkscrew, there is no corkage charged.